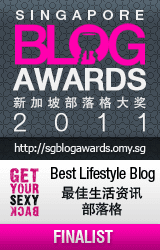 The Wanderer's Journal: Happy 1st Anniversary, Jennifer! 5th of January is Baby Obama's birthday. 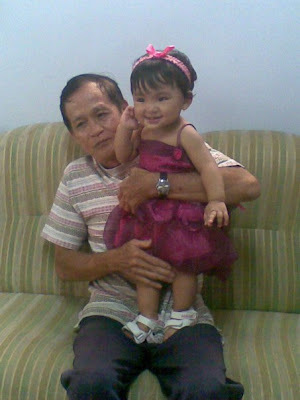 I planned to stay at home and celebrated her first birthday earlier this year when I first visited her last May. Yet, it was just a mere thinking, a talk with no action. I ended leaving Indonesia before even New Year and missed celebrating her first birthday with my family. I celebrated her birthday from afar, from my virtual world. All I got were the stories of her birthday and photos uploaded on Facebook. Sad but I felt good enough to be kept in the loop with every possible development of Baby Obama. 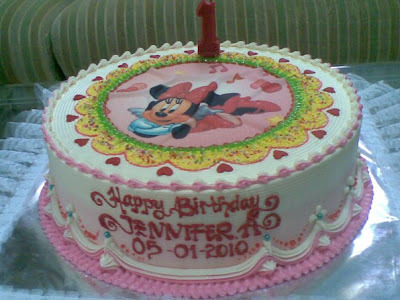 Jennifer's Pre-Order Birthday Cake from Holland Bakery. 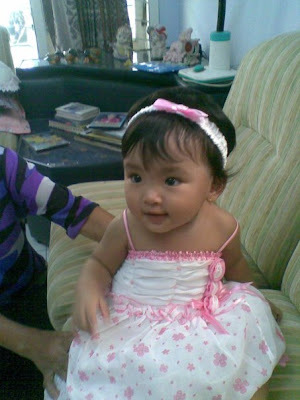 Take 1: Princess Jennifer in her first birthday dress bought by my sister, Lidya. 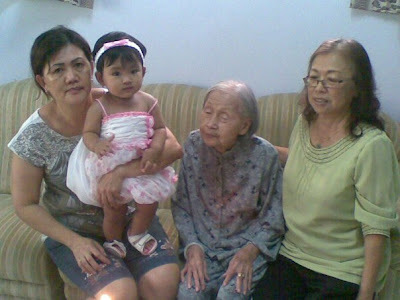 4 Generations Photo: My Mom, Baby Obama, my Grandma and my Auntie (Jen's Grandma). Take 2: Jen posing in second birthday dress with my Dad. 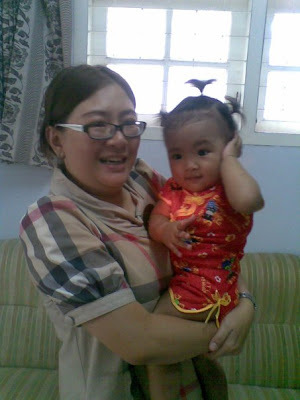 Take 3: Jen posing in red cheongsam with her Aunt Ding-Ding. Pastel Tutup: The birthday's giveaways from my Aunt, distributed to close relatives. If you notice, somehow Baby Jennifer understood that very day was her birthday. She could not stop sharing her best smiles with people around her that day and her smiles were different. They were honest and ecstatic. Happy 1st Birthday, Jennifer! Please always remember that we are so blessed to have you. Since the first day you came to our lives until this very moment, you've been giving us immeasurable laughter, pure joy, melting love, indescribable cheers, warmth and affection. God has indeed sent you to us for reasons: to feel a very genuine love from you, be loved and to always love you. We love you beyond words, Baby Jennifer. Always be a happy, healthy, loving and sweet little darling. ** Photo credits by Lidya A. T.